Samuel Pohner, straight out of California’s Bay Area, weaves garage, funky, house, dub, techno, juke, and club elements together in a deft and clean production style. 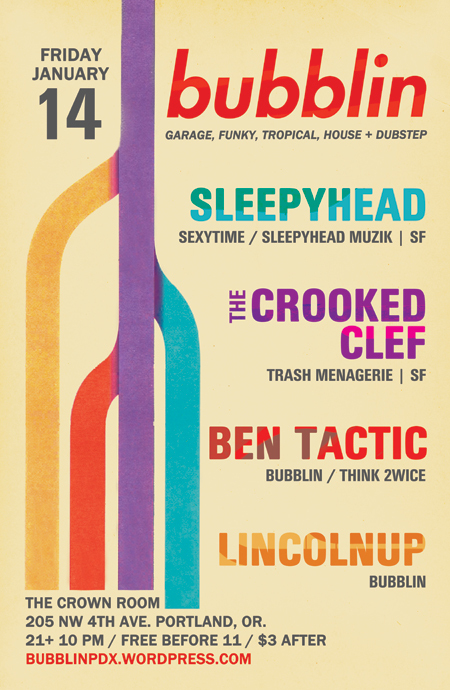 Sleepyhead’s DJ sets are known for getting hips swiveling and brains buzzing with percussive, shake n’ bake rhythms, warm low-frequency bass tones, and well parsed melodies and vocal samples. Also half of West Coast power bass duo Sexytime along side Mimosa, Sleepyhead has traveled the US filling dancefloors and vibrating sternums. Give a listen to this blazing exclusive mix Sleepyhead broke off to herald his upcoming appearance at Bubblin! Stefan Nickum is a writer and DJ currently living in the Bay Area. Stefan DJ’s as The Crooked Clef and his mixes have been written about in the New Yorker online, the Atlantic online, and Seattle’s weekly publication The Stranger. Stefan also helps run a music blog called Trash Menagerie where he has spent the last 3 years writing about various strains of club music. Current interests include: world music 2.9, afro-futurism, living love, ghettotikitech, and the supernatural powers of bass. This entry was posted on January 7, 2011 at 9:47 am and is filed under Uncategorized. You can follow any responses to this entry through the RSS 2.0 feed. You can leave a response, or trackback from your own site.